This is the right side of the desk, with the pigeonholes and adjustable shelves installed. The shelf molding above the pigeonholes is 3/4″ oak glued directly to the edge of the shelves. The space above the pigeonholes will hold a drawer. Handmade doors will cover the pigeonholes as well. The pigeonhole spacers are made of 1/4″ oak plywood spaced about 2″ apart. They are 9″ deep and 12″ high and set into the top and bottom planks in 1/4″ channels I cut into them. When the entire assembly was finished I inserted it into the space built into the desk and fastened it into the walls with screws. I added oak molding strips over the top and bottom edges to finish this part. The adjustable shelves to the left are simple wooden strips 1/4″ square glued to the walls of the desk at different heights. 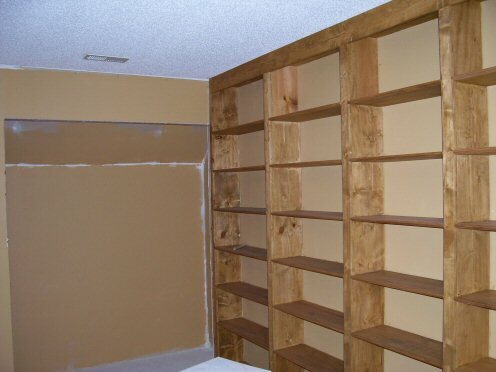 The shelves are 1/4″ oak plywood with a reinforcing strip of 1/4″ oak wood underneath, and a piece of 1/4″ oak in front. 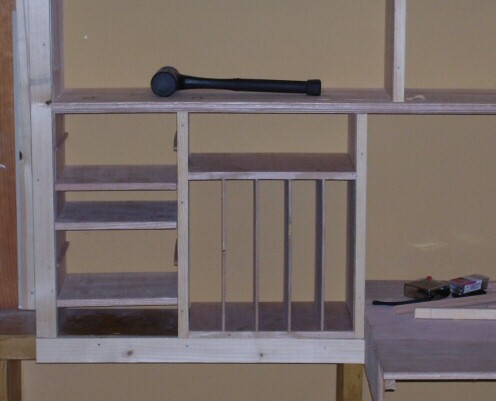 Each side has three of these shelves, with five possible positions. I’ve installed the pigeonholes and adjustable shelves on either side of the desk in this photo. You can also see some of the tools I use; my 3 pound “persuader” (the black plastic hammer), various types of clamps on the desk, a measuring tape, and some different types of nails. The pigeonholes were assembled as one piece and then inserted into the opening. 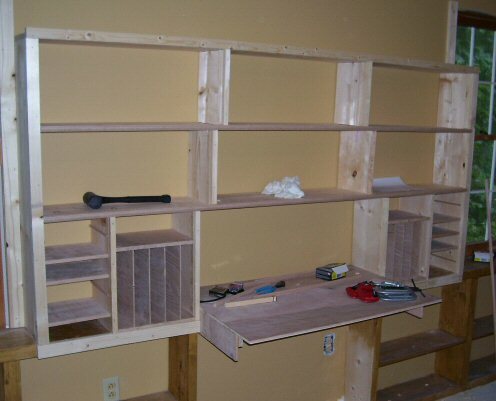 The adjustable shelves were built in place. 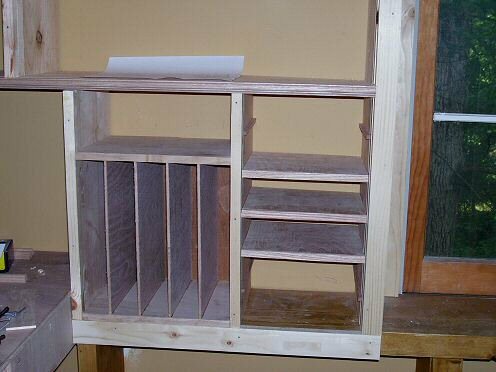 The space above the pigeonholes will hold a drawer, and a door will cover the pigeonholes themselves. 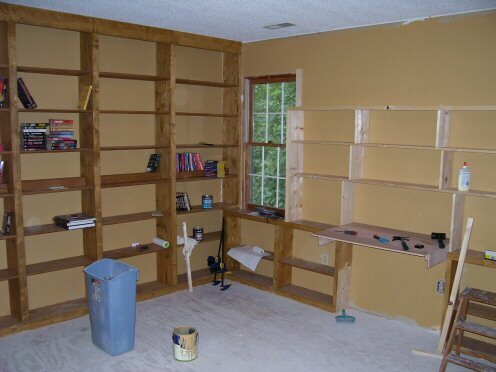 The corner where the window bookcases, desk and large bookcase meets can be seen in this photo. The windows open to the north behind the house, where a forest is just a few feet away. You can see some books already in place on the bookcase, and some inserts I built to maximize the space on the shelves. Paperback books don’t take up a lot of space on a 10″ wide shelf, so I made some wooden half-shelves that allow us to put two rows of small books on each shelf. The half-shelves elevate the back row of paperbacks over the front row so you can see the titles, doubling their storage ability. The floor is unfinished as of yet, but will eventually be covered with hardwood flooring that matches the bookcases and desk. The large bookcase takes up the entire west wall of the library, a full 13′ in width and reaching up to the ceiling. With seven shelves, each 10″ wide and 13′ long, this one bookcase has more storage space than all the smaller bookcases I have in the rest of the house. The closet at the end of the bookcase I will convert into a computer nook, with a sturdy desk, storage space and a vent to move heat generated by the computer and monitor into the uninsulated space behind the wall.